Purdue Pharma, the company that makes OxyContin, has settled a lawsuit with the state of Oklahoma and will pay roughly $270 million over claims that the company helped fuel the opioid epidemic. Major media outlets all cite “people familiar with the matter,” but neither Purdue nor Oklahoma’s Attorney General have issued a public statement yet. OxyContin was first introduced in 1996 and critics allege that it has fueled an opioid epidemic that has killed thousands of Americans. Roughly 130 Americans die every day from an opioid overdose, according to the Centers for Disease Control and Prevention. Purdue Pharma allegedly encouraged overprescription of the drug and downplayed the health risks. According to the New York Times, $100 million of the settlement will help fund a new addiction treatment center at the Oklahoma State University-Tulsa. The billionaire Sackler family, which controls Purdue Pharma through Connecticut-based trusts, will also shell out about $70 million to the new treatment center despite the fact that they weren’t personally named in the lawsuit. Another $70 million of the $270 million settlement will reportedly go to “litigation costs.” There’s no word yet whether any victims of the opioid crisis in Oklahoma will see any money directly, though that seems extremely unlikely given how the money is being divvied up. 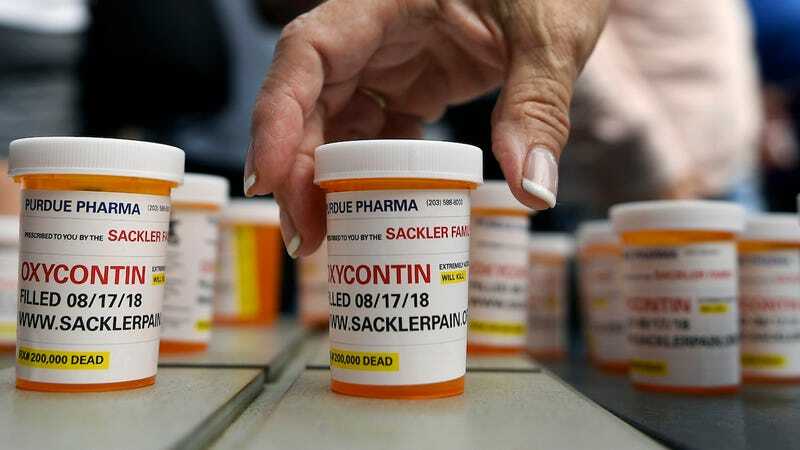 Bloomberg found that the Sackler family made over $4 billion from OxyContin sales and other businesses between 2008 and 2015. The trial against Purdue in Oklahoma was scheduled for May and everyone was keeping a close eye on this one because it was the first in the nation. There are an estimated 1,600 lawsuits that have been currently filed by municipalities across the country. The next opioid-related trial against Purdue isn’t scheduled until the fall in Ohio, according to the Wall Street Journal. If history is any guide, the lawsuits could be consolidated in the future. When state Attorneys General started suing the tobacco companies in the 1990s, they were all pursuing individual lawsuits. After a handful of states started to win to recoup state medical costs from tobacco-related illness, like Mississippi, the rest of the lawsuits were put together into something called the Master Settlement Agreement in 1998. Notably, the first AG to win against Big Tobacco, Mississippi AG Michael Moore, is also spearheading efforts against Big Pharma in this latest fight.